I really love cornbread, and I have several recipes I use depending on what I'm in the mood for. Ina's Jalapeno-Cheddar Cornbread is my go-to, but if I want "real" cornbread, I use the Lee Brothers' Thin and Crispy Cornbread. So I wasn't really all that excited to make corn muffins for this week's Project Pastry Queen recipe. Until I tasted them that is. They are um, rather rich. Butter, sugar, and heavy cream... but that's what makes them so good. That and the fresh corn kernels that is. One of the things that I like about this recipe is how open it would be to adaptations. I'm sure subbing half-and-half or even buttermilk would work well, and I think bell peppers, jalapeno peppers, cheese, and onions would all be great mix-ins. They are also a snap to throw together. In less than 30 minutes, and you're enjoying a warm piece of corn muffin. Thanks to Amanda of Fake Ginger for choosing this recipe - I guess I have another "go-to" recipe for cornbread now! 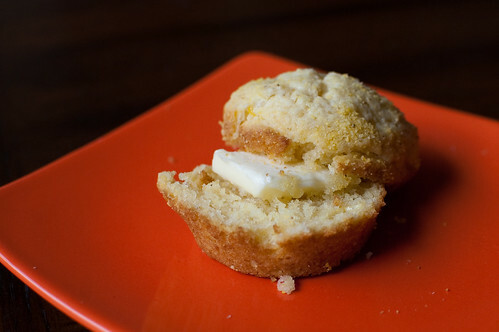 If you're interested in making these muffins, she has the recipe posted on her site. Next week - go big or go home with Texas Big Hairs Chocolate Hazelnut Meringue Tarts! Yay, I'm glad you liked my pick! It looks delicious with all that butter!